Here you will find brief information on different statistical items. Hattingen is located on the southern border of the Ruhr area. The neighbouring large cities are within easy reach and you can get to the countryside just as quickly. The easiest way to reach Hattingen is via the Autobahn A 43, exit Witten-Herbede (21) or Sprockhövel (22). From here you will travel to Hattingen via federal highways or country roads. 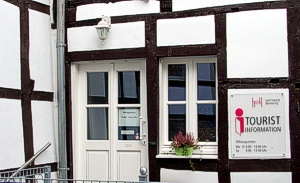 In Hattingen, you will find about 1,600 well-marked parking spaces in the city centre. The parking garages and car parks are open around the clock. The costs are 0.40 / 0.60 Euro for each half-hour or 4.00 / 6.00 Euro for a day-ticket (Monday - Friday from 9 am to 7 pm, Saturday from 9 am to 6 pm). Parking in Hattingen is otherwise free-of-charge! Within 45 minutes by car or about 60 minutes by public transport, you can reach the Düsseldorf International Airport.